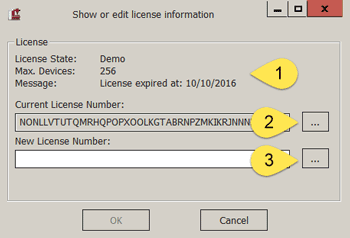 When you start the program or service the first time without a license CNCnetPDM automatically creates a license number for your copy. Without a license number initially this is a demo license for an unlimited number of devices. This is ideal for testing. The ONLY limitation of this license type is that device drivers output a restricted number of configured items. For an unlimited number of devices. Device drivers output a restricted number of configurable items. In addition time-limited versions of license types Device or Server are available. To purchase a license or get a time-limited license for testing please contact our sales and support department. Copy your current license number from log-file log_master_YYMMDD.txt or from CNCnetPDM.ini and send it by email to the sales and support department. To register a new license received from inventcom you also have two options. Exchange your current license number in file CNCnetPDM.ini with the one received from inventcom, restart the program or service. Double click on CNCnetControl.exe with your service running. Click on Button ‘View / Edit’ under ‘License’. Copy the license number from the email received from inventcom to the clipboard. Click on the button (3) right of field ‘New License Number’, this pastes the new license number into the appropriate field. If you entered a valid license number button OK gets activated. Clicking on OK immediately registers the license, no restart of the program or service is required! In case everything worked well the information in the top area (1) of the license dialog changes accordingly. If you enter an invalid license number, copy your program to another PC or activate MS Windows at a later time CNCnetPDM automatically creates a new demo license on next startup.